• A total of 40 game fish may be kept in any one day. This total shall not exceed more than the limits or exceptions listed below. Any game fish or species with a size limit listed must be landed with head and tail fin intact. All freshwater fish species in the state of South Carolina are measured using total length. Special limits and regulations apply to SCDNR managed lakes. • Check with state parks, city reservoirs or county parks for special limits and regulations that apply to those areas. Lake Keowee Smallmouth Bass 12 inches No more than 10 combined total of smallmouth, largemouth, redeye, spotted bass or their hybrids. Statewide except the water bodies listed below: Redeye Bass Any length No more than 5 combined total of smallmouth, largemouth, redeye bass or their hybrids. Report potential record breaking catches at your nearest regional SCDNR office. TL=total length measure; Tip of snout with mouth closed to tip of tail. Tail should be pinched. All freshwater fish species in the state of South Carolina are measured using total length. 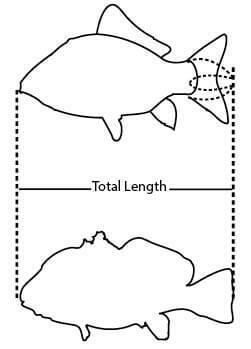 Some saltwater species are measured with fork length.